Habitat and ecology: The cactus grows on rocky outcrops and stony fields in pampa grasslands. Frailea aureispina, grows together with Frailea castanea. Description: Frailea pygmaea subs. 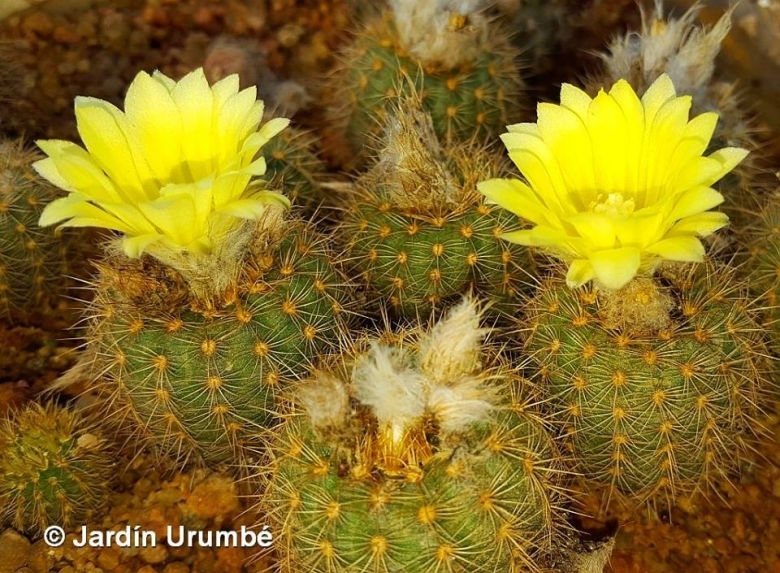 aureispina firstly described as Frailea aureispina by Friederic Ritter in 1970, is a very small cactus with shortly cylindrical stems covered by golden-yellow spines. It is usually included within (as a synonym of) Frailea pygmaea. However, this taxon is the one that least resembles Frailea pygmaea, the dark felted areoles are similar to the areoles of Frailea phaeodisca, and the yellow to orange spines are noticeably stronger than those normally found in F. pygmaea. Note: In the area North of Quarai where Frailea aureispina grows, no other forms of F. pygmaea grow, but Frailea schilinzkyana (Frailea perumbilicata) is quite common. This latter species also has strong spines, which vary from yellow to dark brownish in colour, but other than in these characteristics it does not resemble F. aureispina. It is possible that F. aureispina is not related to F. pygmaea at all, its characteristics being the result of natural hybridization between F. phaeodisca and F. schilinzkyana (F. perumbilicata), both of both of which grow nearby. This is just a hypothesis, but clearly this is a plant that needs to be studied in more detail. Stems: Cylindrical, bright green, 15-25 mm thick, 3-5 cm high, solitary. Ribs: 13-18, 0.5-1 mm tall, dissolved in round tubercles, only 0.5-1 mm high. Areoles: On the tubercles, 0.8 mm long, 0,5 mm wide, with reddish-brown felt, later naked, 1-1,5 mm apart. Spines: Pale to orange yellow with a reddish-brown base. Radial spines: 10-13, 3-4 mm long, acicular, usually straight, all around the areole, spreading sideways or partly erected. Central spines: Absent, or 1-2, protruding, not longer than radials, similar in colour or brownish. Flowers: Apical, 4 cm long, and over 4 cm wide when fully open, pericarpel 7 mm long, 4 mm thick above, tapering below, tawny brown with small narrow reddish scales, dense grey wool, and reddish-brown fine bristles. Nectaries absent. Flowers tube 8 mm long, 10 mm wide above, pale yellow internally, externally yellowish-green covered as the ovary. Filaments pale yellow, red at base, set up to 2 mm below the upper edge of the tube. Anthers pale yellow. Stylus about 2 cm long, pale yellow, the lowest 2 mm united with the tube with c. 6 pale yellow stigma-lobes 6-7 mm long. Petals 22 mm long, 3-4 mm wide, greenish yellow. Seeds: Cap-shaped, nearly black, shining, light, 1,5 mm long, 2 mm wide.